Rental Rental Truck Sixt $90.00 Pick up in evening; Sixt doesn't open until 7AM on the 30th. Storage Bike Boxes from Wrapping Guy Bike Boxes from the luggage wrapping guy at FRA. Brent & Laura. $75.00 DHL dimensions are too small for the bike wheels, so shipping via DHL is out. With the inferior WiFi, early this morning I spent about 1.5 hours getting about 5 minutes worth of research done. I found some moving supply places that looked promising for buying boxes. We had finished up so late last night that we ended up not buying breakfast groceries before we went back to the AirBnB. So, this morning when everyone was ready to move, we came into town and had breakfast at the Haupbanhof (main train station). We then took the tram out to LagerBox, which to me looked like the most promising moving supply place. Finally, luck was in our favor. We bought two wardrobe boxes (for the bikes… Brent and Laura will have to cut them to size and reinforce them), and three packing boxes for our other stuff. What a relief! Back onto the tram we got with all the boxes and rode the tram, then the train, to the Flughafen. I am currently waiting at the Flughafen with the wardrobe boxes (right across from the DHL). Brent and Laura have taken the packing boxes back to the AirBnB and are going to return with their bikes to pack up and ship off at the DHL here. Assuming that our "Kelsterbach" is over with, they should be back here soon, pack their bikes up, and pass them straight over to DHL, which should cost €99/ea, which is the same as taking them as luggage on the airplane ($100 for oversized luggage and $50 for second piece of luggage). 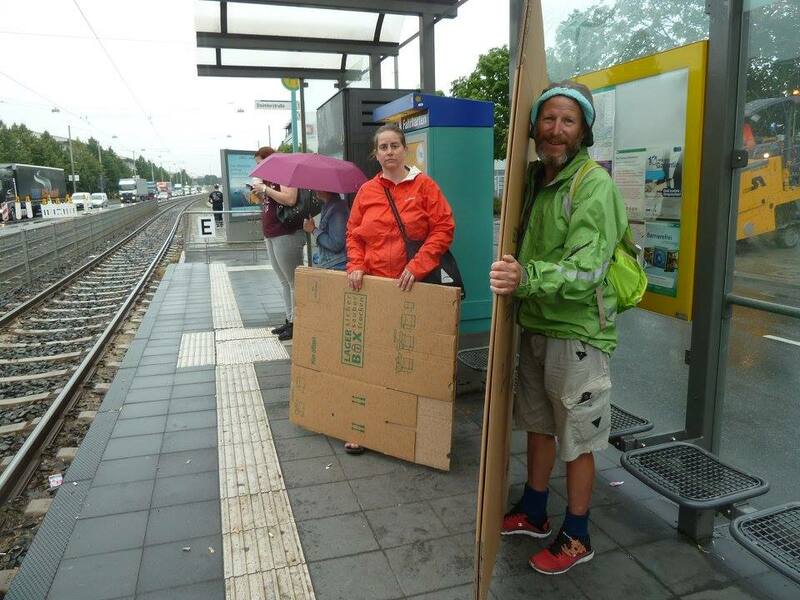 Laura and I have vowed, no more looking for cardboard (bike) boxes at the end of a bike tour. We will buy the small bike bags that Laura has found, or we'll rent bikes. Even ever-optimistic Brent has said that if it's going to be this hard to get the bikes home after, he'd be interested in renting. Now THAT'S something. I messaged two "small time" bike repair guys to see if they wanted Dewie, or could suggest someone who might want her. They've both replied to say they want her, but with my bad WiFi, I only saw the messages today. I've responded back to them. Hopefully I can connect with one of them and get her shipped off to start her new life. Annnnnd... the saga continues. The largest dimensions for DHL are too small (for bike wheels). So, Brent checked on luggage storage, which is do-able with pick-up early tomorrow morning. We also ran into a couple of cyclists who told us that the luggage wrapping guy in departures sells bike boxes for €25/ea. The wardrobe boxes are proving difficult, so Laura and Brent have opted to buy the bike boxes. Hopefully they'll have their bikes packed up and into luggage storage sometime this afternoon. If our "Kelsterbach" karma will allow it. I have a guy coming past the Kelsterbach "S-Bahn" station at 6PM to get Dewie. I'd contacted a couple of little local bicycle repair guys to see if they wanted her, and they both did, so the first guy I talked to gets her. Hopefully THAT works out. It was always my plan to leave Dewie behind in Germany rather than bringing her back to Canada. She was ridden hard by her previous owner, and by myself, and she had some “pre-existing conditions” before we even went to Germany. I knew I wouldn’t want to pay the $200-ish to bring her back. So, I packed the original pedals and front skewer along on the tour so that when I left her behind, I could keep my long skewer and clip pedals, but still give someone a rideable bike. Before we reached Kelsterbach, I’d used Yelp to reach out to a couple of local small bike repair guys to ask if they’d like to have Dewie when I leave her behind in Germany. Because of the lack of WiFi at our accommodation, I’ve barely been able to check anything… especially e-mail. Today when I was waiting for Brent and Laura at the airport, I had access to the WiFi there, and checked on some things. The first thing I noticed was a message from a young fellow named Jonas who is learning to be a bike mechanic and wanted Dewie as a “test subject”. Perfect fate for her since she has some mechanical challenges. I replied right away to make arrangements to give Jonas the bike. Then I noticed that I’d actually already received a message from Sven, two days earlier, from the other shop. He overhauls and sells used bikes to cover shop costs and wanted Dewie for that. That would have also been a good solution for her. I felt bad because Sven had messaged me first, but I’d already promised the bike to Jonas. I told Sven that he could have her if Jonas didn’t work out. My arranged time to meet Jonas was 6PM in Kelsterbach. A rain shower had just blown through and I was standing in the drizzle with Dewie. By about 6:08, I was starting to wonder if Jonas was going to show, when suddenly, here was a young guy approaching. He was SO nice, and SO excited about getting the bike. He even gave me a little bag of presents as a thank you – some cookies and candy. SOOOO sweet! I am so happy about the way it worked out. Brent and Laura were waiting in the nearby restaurant, and Brent had gotten up to have a look when he saw a young guy ride by on a bike looking “really happy”. Yay! Yay for Jonas and Yay for Dewie! Have fun on your next life adventure, Dewie! Finally found some boxes at LagerBox. Taking them on the tram. 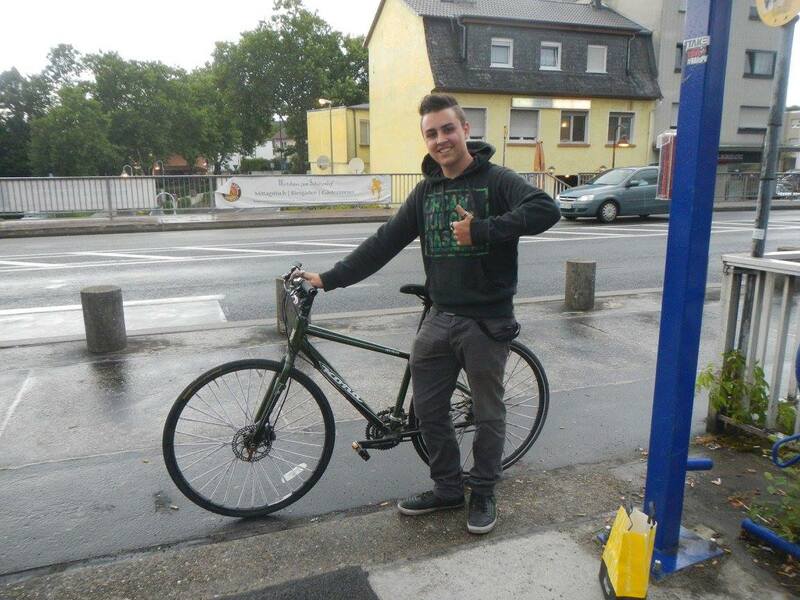 Jonas the young bicycle repair guy scores a bike. Bye, Dewie! Have fun in your new life!